The regulations regarding The Protection of Animals offered in Malta Pet Shops were published on 12th August 2013. These regulations lay down the minimum standards for the protection of animals offered in pet shops in Malta. These regulations shall come into force on the 2nd April 2014. 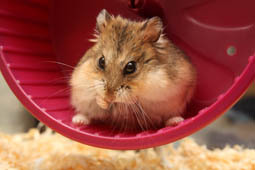 The minimum floor space for every hamster in Malta pet stores is that of 300 cm2, with an extra 75cm2 for every additional hamster. The minimum cage height in pet stores is 20cm. Click here to read all the details.